Unlock possibilities. Create opportunities. Build a legacy. Earning a degree from a Tier One research university like UNT is life-changing, and in University Advancement we are passionate about partnering with alumni and friends to make education attainable and exceptional for our students. When you give to UNT, you support the unique experience that helps our students soar higher. Thank you for investing in our future and becoming a difference maker at the University of North Texas. 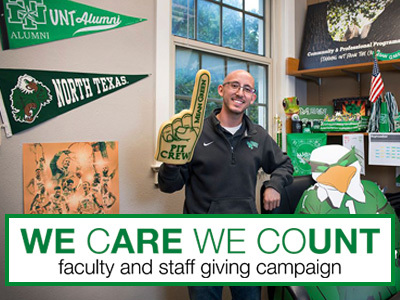 Because our faculty and staff members understand firsthand how giving to the university can transform lives, the community joins together annually to invest in UNT’s future through the We Care We Count Faculty and Staff Giving Campaign. 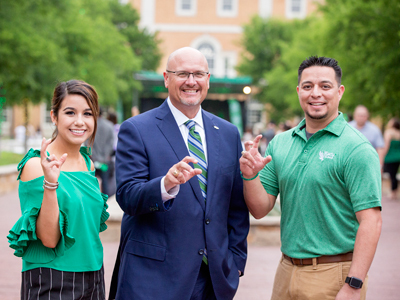 From April 1 to May 3, employees are encouraged to make contributions that align with their own passions and are emblematic of the progress they hope to see at UNT.